Places which seem claustrophobic or simply too small for sensible adult use often have a particular attraction for children. For small children who need constant supervision, there is that good old place under the stairs. Children love small furniture their own size, so if you set up a child-sized table and chairs they will be drawn to them like magnets. Under the stairs is separate but near enough to adults to feel safe,- the space is their own and it feels private. Staircases which are part of the living room provide space which can be completely supervised and this is obviously the best for very young children. Older children who can be allowed a certain amount of unsupervised play will prefer to be under the hall stairs, particularly if it is warm and well lit. Other areas which attract children are attics and basements, but these are only for older children who can be trusted on their own. They need to be able to cope with ladder-like stairs and must know they should not light matches. The sloping roof of an attic can provide an intimate world-of-their-own feeling in which to run a permanent train track or provide private space for reading, music or socializing. Attics are often chilly in winter and suffocating in summer, particularly if the roof space is uninsulated. Insulation is usually inexpensive however, and you may be eligible for a grant. A cheap and fairly effective way to insulate is to fix coarse insulation cork tiles to the sloping walls and ceiling. The strong smell of cork soon fades and if you wish you can seal the tiles or paint them. The tiles make good notice boards. If you want to use an attic as a bedroom, all the furniture should be low so that taller children will not knock their heads. 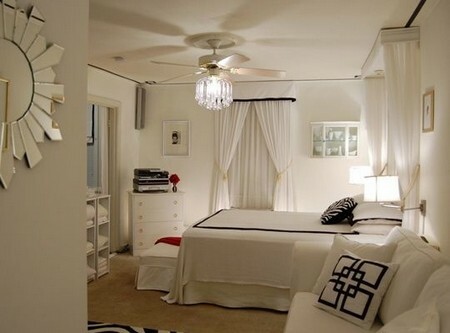 Beds can be of the futon type or simply mattresses on the floor. If it is to be a workspace, place the desk under a window to get the full light and sit on the room side where the slope of the roof is not at its lowest. A good place for a workspace is in the alcove made by a mansard roof, which will be slightly higher than the rest of the room. Always make sure there is some means of escape in case of fire. For heating, place a radiator on a wall where there is no window. Use very low chests for storage and have plenty of hooks for hanging things from. Basements are invaluable for older children who want independence and to make a noise, or at least a different sort of noise to their parents. Basements are, however, likely to suffer from damp and darkness. The damp is most likely to be caused by a faulty damp-proof course or, in older houses, no damp-proof course at all. Get the damp dealt with professionally before you try to use the basement. If you wish, you can also treat the walls inside with one of the various water-repellent treatments available. Cover the floor with warm rugs or matting, and it will be an excellent place for a rocking horse, music system, TV, video, computer and other time- and space-consuming items loved by children.